There are indications that the leadership of the Peoples Democratic Party (PDP) are yet to agree on a venue for party’s presidential primaries fixed for Oct. 6, following a sharp disagreement between the leaders of the party on Monday in Abuja. The disagreement between the Board of Trustees (BoT) and the National Working Committee (NWC) manifested at the inauguration of the party’s National Convention Planning Committee. There was a sharp disagreement between the chairman of the Board of Trustees (BoT) ,Sen. Walid Jibrin , and the National Working Committee (NWC) over the choice of venue. Inaugurating the committee, PDP Deputy National Chairman (South) Elder, Yemi Akinwonmi, said that the party leaders had consulted widely on the venue and agreed for Port Harcourt, River. “On the issue of venue, the party set up a committee headed by Ambassador Ibrahim Kazaure and they went round the South-South Zone and South-East Zone before coming out with the choice of Port Harcourt for us. Akinwonmi added that the international community had expressed their interests in the party primaries. Meanwhile, the chairman of the Board of Trustees (BoT) , Sen. Walid Jibrin, in his remarks said that the party had yet to make final decision on the choice of venue for the convention. “Even though the Deputy Chairman said the issue of venue had been concluded, I want to say that the issue of venue is still on and is not concluded. ” Because there are many suggestions on the issue of venue. We look at all suggestions and I assure you that the issue of venue will be resolved. “But for now we are working around the clock to ensure that we have a very suitable venue accepted by everybody. 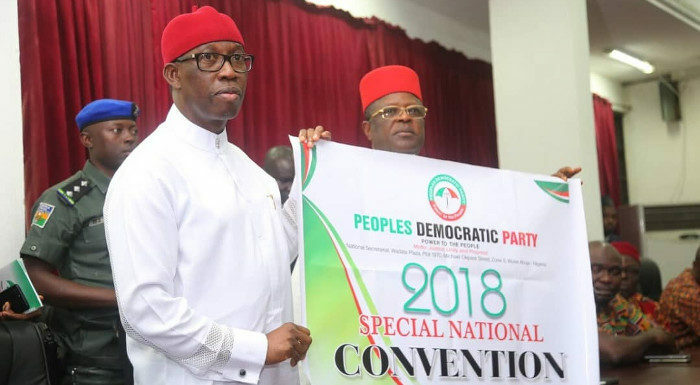 Chairman of the convention committee, Ifeanyi Okowa, also speaking on the matter said PDP was ready to host the convention in any state eventually agreed on. Okowa said that no matter where the convention was settled for PDP would do what was right. Okowa, who appreciated the party for the assignment given to them said that they knew that the party was in very critical moments in the history of the nation and the PDP. “All of us believe that the only way forward is for the entirety of the party to stay united and focused. And as such, as members of the PDP, we cannot afford to disagree on any issues.